Shore crew are extremely valuable to race programs; not only do they act as a central communication line, the added “non-racing” team members allow race crew to rest and recover while necessary tasks are completed. We talked with Quantum Racing’s shore crew member Jane Stevenson about her role and how to form a shore crew for your team. Love what you do - Quantum shore crew member Jane Stevenson is one of the best in the business and has some great tips for your team. 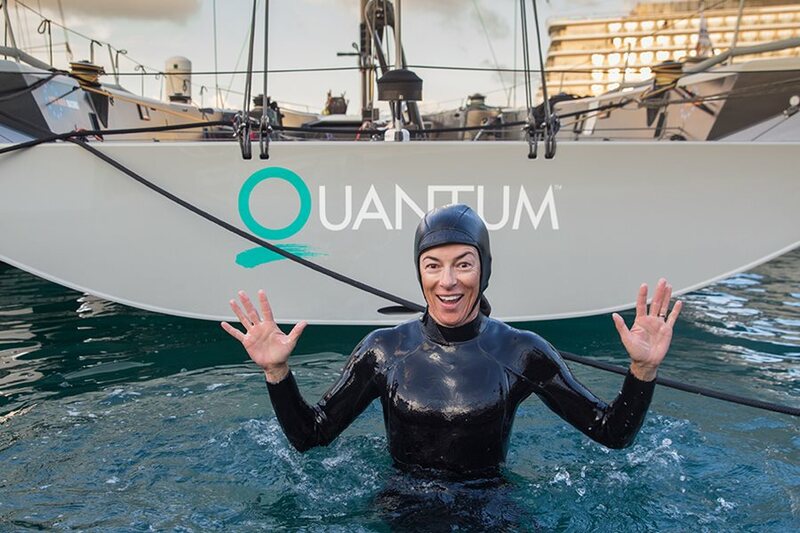 Quantum Racing had another great victory in Key West due in no small part to Jane Stevenson, whose dedicated work behind-the-scenes helped the team race without distractions. Like Jane, a stellar shore crew will do any job needed with knowledge and a positive attitude. Her tips for a successful shore crew can be applied to a crew of your own, or delegate tasks to your team if a shore crew is not in the budget. If you’re a team member or new to a program and find things disorganized but aren’t in the position to start delegating, take a step back and think about what can help things run better. Perhaps you can offer to start an e-mail communication thread, or maybe you’re an experienced rigger and can splice some new jib sheets, or you can fill water bottles, flake sails, etc. At the very least, it’s always worth taking the boat captain aside to ask what you can do to make their lives easier or what they suggest as a good skill to make you an irreplaceable crew. If you’re going to have a successful shore operation, you’ll need a leader. This person can be the skipper, bow, or anyone in between. They need to know where everything is, (spare parts, sails, instruments, etc.) and find a method of delivering information. Some teams use a white board in the trailer, group texts, or perhaps an e-mail thread with all crew included. People want to know details and they like to know the plan, or at the very least that there is a plan. What a shore team manager brings to the equation is central team leadership – a place for information to flow in and out. The key to mastering everything in this article is having a delegated leader. Someone should take this responsibility so there isn’t a constant crisscross of information. First things first – identify what needs to be done. Here is a sample of what Jane handles for Quantum Racing. Obviously, every team is different, so think through every moment of a typical regatta day to map out your team’s list. If you don’t have a designated crew, divide the tasks among crew members (the same every day) depending on their strengths and what they enjoy doing. It’s important to find out what non-paid crew want to participate in. For example, one crew member may really like waking up early to help put the correct sails on board, where someone else might have a hidden passion for splicing late at night. Jane says this is key: “This industry has taught me the importance of teamwork; that everyone plays a significant role, from the top to the bottom, no matter how small that role might be.” The delegation process can be done by choice rather than by random assignment, and all roles should be recognized as important. Once the team determines all jobs and tasks, prioritize and write down the small details. This makes each task clear and repeatable, and they can easily be transferred. A shore crew has the advantage of being able to optimize the boat with proper planning. The same goes for your crew, but without additional shore support you should be more prepared than ever. Make sure your team’s plan takes into account the unexpected and how you’re going to handle it. For example, take the time to know which sailmakers will be at your regatta so you can call them for last minute fixes. Also, pay attention when someone walks by the boat and suggests something needs replacing; they are usually correct. The best shore crew are efficient with their time. They complete necessary tasks and, on top of that, stand at the dock holding lines half-cleated at dock-out time. Their organization helps ease tension and is something that can easily be adopted with some advanced planning. Even if it’s for a Wednesday night race, think about a small thing a shore crew might normally do and try to work it into your routine. This could simply be rigging sails before grabbing a beer or arriving at the boat earlier than normal to learn something new or experiment. 0620 Alarm goes off. Slip into her wetsuit, kisses her hubby goodbye (Chris Hosking, mainsheet trimmer on Provezza). 0700 Arrives at boat. Dives on boat: cleans hull, checks propeller, inspects for any dings, nicks, or damage to underwater appendages. 0730 Diving complete. Whizzes back to crew house for quick shower. 0800 Back at boat. Completes any work from the night before. Sees race boat off the dock by scheduled dock-out time. Jane’s schedule is precise. Like Jane, non-paid crew should stick to the same schedule day-in and day-out so the tasks become mindless and sailors can conserve energy for racing. After the team holds a few practices or tries the new plan at a regatta, the next important key to progression is an organized discussion. What went well? What felt chaotic? What can be improved? A casual scene is best so everyone can relax and give valuable feedback. Whether it’s a debrief for your shore crew or for the crew members taking on the responsibilities, keep it positive and constructive. Shore crew is without a doubt a luxury and a large value to any professional team. With organization and proper planning, the basics of this article can help make winning easier in the absence of a shore team. Stevenson points out, “If you're good at what you do, and love it, work hard. Also, having a sense of humor goes a long way!” Come race time, no unnecessary energy should be spent, no sails left at the dock, and everyone can be at ease.